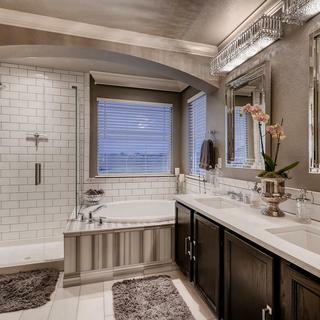 Embellished with an impressive array of crystal rods and accents, this bathroom light glistens in with a chrome finish. This striking bath light includes a combination of faceted crystal columns and other crystal accents on a gleaming chrome frame. The faceted crystal columns wrap three sides of the bath light with square crystal accents along the top and bottom. Loose crystals sit on the metal mesh on the base of the bath bar for even more sparkle. 30" wide x 6 1/2" high. Extends 7 1/4" from the wall. Backplate is 29 1/4" wide x 4 1/2" high. Includes four 40 watt G9 base halogen bulbs. Maximum 40 watt bulbs. Crystals columns bathroom light by Possini Euro Design®. Clear crystal rods and square accents. 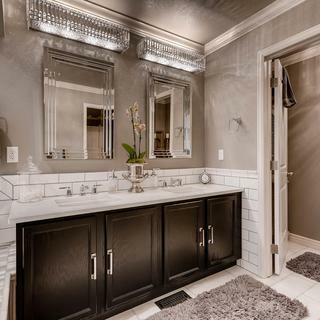 This vanity light was chosen to add a glamorous touch to a master bath. Love the look, and purchased previously. How many loose little round crystals does it come with? Can you get extra? How many? How much? Does this light come in brushed nickel? BEST ANSWER: Hi - this does not come in brushed nickel, only a chrome finish. I don't know but the light is spectacular! Does it come smaller? Also How big is mounting plate cover? BEST ANSWER: Hi Nilsa - The backplate for this light measures 29 1/4" wide and 4 1/2" high. The backplate for this light is 22" wide x 4 1/2" high. Is this fixture easy to clean? BEST ANSWER: First, we love this fixture. It is unique and stunning. We have had it installed for 9 months and have only had to lightly clean it once. We used a can of compressed air to blow off the dust. To detail clean it we will need to remove the glass pebbles and the the glass pieces that hang. Here are probably 50 to 70 glass peices. Yes this will take some time but I think the beauty of the fixture is worth it. I have 2 that haven't needed cleaning yet. I would guess just use something like a feather duster. They are spectacular! So far I've only feather dusted it but it remains sparkly..love it!! overall the fixture is beautiful, nice design, very sparkly. My only issue with the fixture is that the bottom grid gets filled with small crystals. These are loose and not attached. It seems a bit messy and a little odd too me that they don't attach. It does look great, just bothers me that they are not attached and about 100+ small crystals just sitting on the bottom metal grid. Seems they should be attached. Manufacturer said no, just spread all the little crystals along the metal grid. Beautiful and elegant. 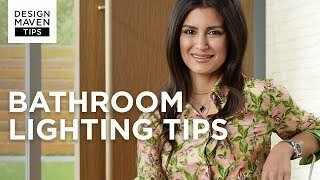 Not enough light foe your bathroom if it's big. I have to turn on 3 lights to make it really function in the evening. Might try higher watts if allowed. These lights make the bathroom. Nightmare to clean, but gorgeous. I love it. I installed it myself very easy. 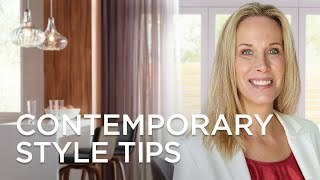 The crystals are easy to put on and the crystals that lay in the bottom help give more sparkle. 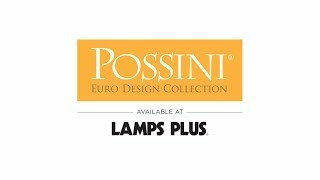 Possini lamps are so pretty if you want something beautiful and different. I Used this light in a business restroom. Love it! It’s beautiful! I thought maybe it would stand out from the wall too much but it is perfect. BLING IS IT!!! I totally love this fancy light bar. I loved my light bar! Truly HAPPY! Really love it, easy to put together. Looks so pretty above the bathroom vanity. Really gives a special pop of bling to the room. Love it!! I would definitely buy it again!! I used this in my master bathroom. It looks awesome! 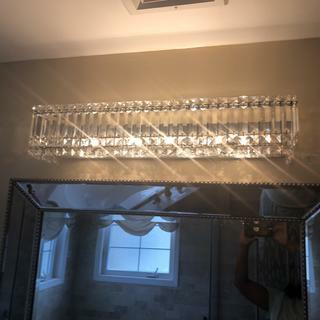 The Possini Bathroom light was easy to install and the crystal hanging was a breeze. 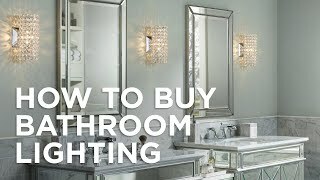 We love out light and it adds so much class to our guest bathroom.